If you’re a retro game collector with tons of cartridges on your shelves, you can forget about playing NES games on your Nintendo Switch. My Arcade just revealed a hot new portable retro console at CES 2019 that’s practically designed for old-school gamers like you. Say hello to the Retro Champ Console. “The Retro Champ Console breathes new life into retro gamers’ NES and Famicom cartridges without the need for a legacy console. My Arcade’s new console includes a built-in 7 inch screen that allows for portable play with 3 to 5 hours of playtime via the built-in rechargeable batteries. Retro gamers looking to play from the comfort of their couches can connect the Retro Champ to their TVs via the console’s HDMI output and pair with My Arcade wireless controllers (sold separately). It’s hard to ask for more. 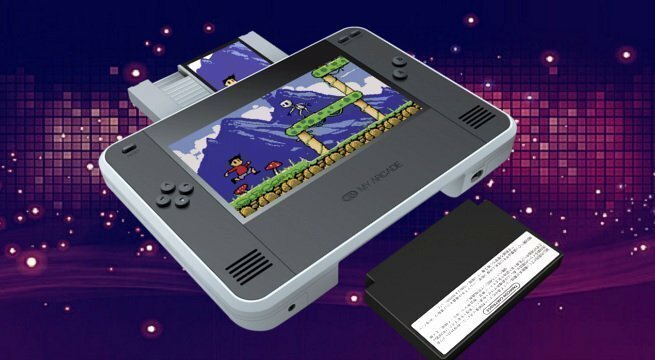 This is a portable NES, with a built-in screen, and 5 hours of battery life. If this sounds like your perfect retro console, you can look for the Retro Champ Console this summer for $79.99. If we get our hands on one, we’ll update you with impressions straight away!